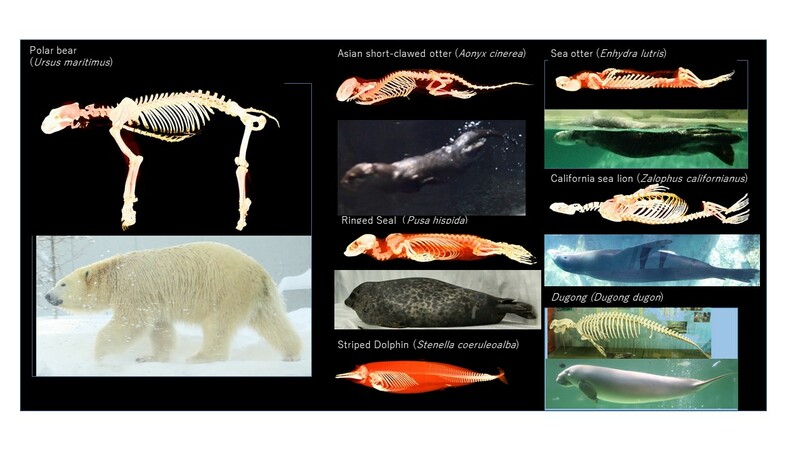 Mammals are secondary swimmers, meaning that even wholly aquatic species such as whales and dolphins have are descended from terrestrial ancestors, which may have returned to the water in order to access foods or escape from terrestrial predators. Primary swimmers are those whose entire evolutionary history is aquatic, such as fish. Many terrestrial mammals can swim, using cranio-caudal movements of the hind feet and/or forefeet. The semi-aquatic mammals, such as otters and the platypus, have physical adaptations for swimming such as webbed feet whereas the fully aquatic mammals such as whales and dolphins, manatees and seals have limbs and tails modified into flippers or fins. All aquatic mammals swim using vertical undulations of a flexible spine. This vertical movement is characteristic of mammals, and evidence of a terrestrial ancestry. In the primarily aquatic fish, swimming is achieved using lateral (side to side) oscillations of the body axis and tail(ref.5,ref.7). Fig. 33 Aquaticlocomotion1,Whales and dolphin produce hydrodynamic force by dorso-ventral tail beat. 2,Fur seals and sea lions use pectoral and pelvic flippers. 3,many terrestrial mammals swim using pedaling of hind limbs and/or forelimbs. Whales and dolphins swim using a laterally spreading caudal (tail) fin which flexes to convert the forces generated by vertical movements of the tail into backward force – the animal effectively pushes off the water behind it to propel itself forward. 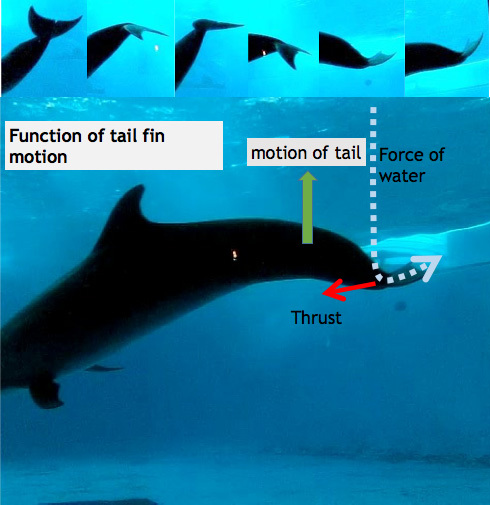 The mobility of caudal fin is key of swimming speed of dolphin. The crucial mobility of the tail fin is permitted by the near-spherical shape of the ball vertebrae at the base of the tail fin. Fig. 34-1 The movements and function of tail fin. The movement of the caudal fin changes the direction of the power of water and trust. Fig. 34-2 Shape of vertebra. There is the ball vertebrate in the root of the caudal fin. The ball vertebrate without process has high movability for any direction.